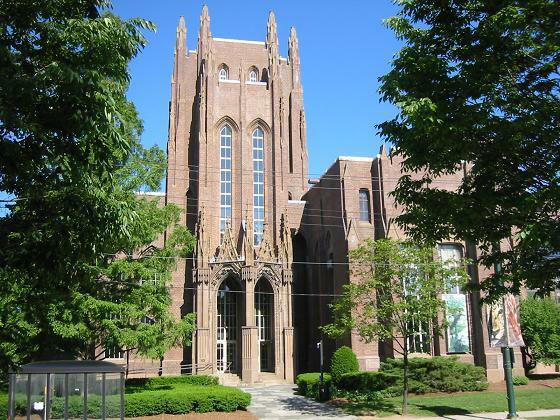 The Peabody Museum of Natural History is a famous natural history museum at Yale University in New Haven, Connecticut. The museum was founded in 1866 by the philanthropist George Peabody at the behest of his nephew, Othniel C. Marsh. Inside the museum are exhibits dedicated to human and mammal evolution, wildlife dioramas, birds, minerals and Native Americans of Connecticut, but the museum is perhaps most famous for its Great Hall of Dinosaurs, which contains a mounted juvenile Apatosaurus and 110 feet (34 meters) long mural, entitled "The Age of Reptiles".